For one of these Dark Shadows tie-ins, this entry was pretty good. The series, written by Dan Ross under his wife's name, is odd in that it doesn't follow the TV series and generally uses only a character or two from the actual show, so they seem to take place in an alternate timeline from the show. This is acceptable, since the show itself delved into parallel time! Ross lived in Canada as well, and didn't watch the show on a regular basis! Why they asked him to write the novels is anyone's guess! But that said, it was a fun read, although (Spoiler!) anytime someone sees a "ghost" in a Marilyn Ross book and someone supposedly died months or even years ago, you can depend on the ghost being that person and they really didn't die, they're just being held in the tower room/secret room/basement.Ross also doesn't worry much about explaining his time travel element. Maggie Evan visits a tomb and suddenly wakes up in 1880! Happens to us all at one time or another! Oh, yes, and Ross loves exclamation points!Sounds like I didn't like the book, but of course I'm forgiving him his transgressions. Apparently Dan Ross wrote A LOT of gothic romances like this, and he obviously had some talent in this area. He man can set a mood, that's for sure. And if you don't go in expecting "War and Peace" you might find yourself entertained for a few hours. A quick and enjoyable read,. I love Gothic, I love Dark Shadows. For fans of the show and films but don't expect too much in the way of epic. Good reading my friends. The story starts out with Barnabas and Maggie in Giles Collin's tomb where they find a hidden room for the coffin of Valeria Norris. Asa Collins hated her. Somehow (totally unexplained)Maggie ends up back in 1880 at the time of Asa Collins. She is at Collinwood but without her memories. She meets a woman named Aunt Polly and Giles Collins himself. Maggie doesn't know anyone there but is taken as a friend of Valeria Norris. Maggie has a problem in seeing a "pink ghost." Barnabas shows up. He has two female helpers and the villagers don't like them. There are also nasty rumors about Giles himself.It turns out Giles is a mad scientist, a woman gets murdered, Maggie is captured and strapped to a table and Barnabas continually has told Maggie to leave Collinwood.The story doesn't work as well as it could. How Maggie goes into the past and then gets back into present time is not explained and her losses of memory aren't either. The story would have been much better if it started the same way and then Barnabas relates the events that had happened (saying he found it in his research) without Maggie going into the past at all. Loved it, used to watch the show, now can enjoy the books. Wish I had all 33 of them. THE PHANTOM OF BARNABAS COLLINS is a time travel adventure. It introduces Maggie Evans, in 1969, as the new governess at Collinwood. What has become of Victoria Winters we don't know...she simply disappears from the storyline. Maggie is depicted as a sweet but rather helpless type, a "damsel in distress." She falls in love with Barnabas Collins, not realizing that he's a vampire. And then one night he lures her into the family crypt to inspect the final resting place of one "Valeria Norris." Maggie then grows dizzy, faints and is somehow transported back in time to 1880! She wakes up in a mental fog, unable to remember anything. But the nineteenth-century Collinses all seem to know her and make her very welcome at Collinwood. In fact, one of them---Dr. Giles Collins---claims to be in love with her. And by his side is the pretty Valeria Norris, still very much alive in the year 1880... Displaced in time and suffering from amnesia, Maggie must survive as best she can. She tries to unravel the mystery of the "Norris Curse," whatever that may be. And then there's the weird phantom in pink that she keeps seeing, who may or may not even be real. Dr. Giles, initially her friend, turns out to be a mad scientist with a diabolical agenda. 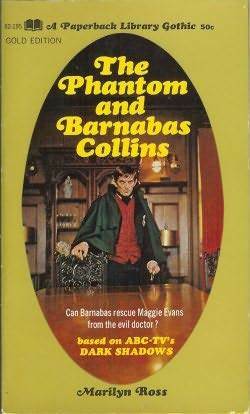 The only one that Maggie trusts is Barnabas Collins, who resurfaces in 1880 to be at her side. But after a maidservant is found dead and completely drained of blood, Maggie fears that Barnabas himself could be the killer! FOOTNOTE: Author Dan("Marilyn")Ross deleted Victoria Winters from the book series without explanation. This was done, presumably, when the actress who'd played her---Alexandra Moltke---vacated the role. Towards the end of his life Ross admitted that he'd wanted to marry Victoria off AND reveal her true parentage, prior to Maggie's arrival as the new governess. Currently there's an online novella, "The Secret of Victoria Winters," that ties up the loose ends as originally conceived by Ross. In this alternate history: (1) Ernest didn't really die in the plane crash. He returns to Collinwood alive, to everyone's surprise, and marries Victoria; and (2) Victoria is revealed to be the long-lost daughter of Barnabas Collins! She was conceived in the 1940's during a time when Barnabas found himself temporarily free of the vampire curse. Her biological mother (who died young) was the best friend of Elizabeth Collins Stoddard. Finally, Maggie Evans makes her first book appearance since serving Victoria Winters a cup of coffee in Book 1, and immediately goes back in time!!! Not bad, but Maggie's unwillingness to accept any evidence, do any investigating, or be useful at all was a bit tiresome.